We demonstrate how to perform macrophage MR imaging using ultrasmall superparamagnetic contrast agent (USPIO) in septic arthritis, allowing an initial and longitudinal in vivo non-invasive evaluation of macrophages infiltration and an assessment of therapy efficacy. Bierry, G., Lefevre, S., Dietemann, J. L., Jehl, F. In vivo Macrophage Imaging Using MR Targeted Contrast Agent for Longitudinal Evaluation of Septic Arthritis. J. Vis. Exp. (80), e50296, doi:10.3791/50296 (2013). Macrophages are key-cells in the initiation, the development and the regulation of the inflammatory response to bacterial infection. Macrophages are intensively and increasingly recruited in septic joints from the early phases of infection and the infiltration is supposed to regress once efficient removal of the pathogens is obtained. The ability to identify in vivo macrophage activity in an infected joint can therefore provide two main applications: early detection of acute synovitis and monitoring of therapy. In vivo noninvasive detection of macrophages can be performed with magnetic resonance imaging using iron nanoparticles such as ultrasmall superparamagnetic iron oxide (USPIO). After intravascular or intraarticular administration, USPIO are specifically phagocytized by activated macrophages, and, due to their magnetic properties, induce signal changes in tissues presenting macrophage infiltration. A quantitative evaluation of the infiltrate is feasible, as the area with signal loss (number of dark pixels) observed on gradient echo MR images after particles injection is correlated with the amount of iron within the tissue and therefore reflects the number of USPIO-loaded cells. We present here a protocol to perform macrophage imaging using USPIO-enhanced MR imaging in an animal model of septic arthritis, allowing an initial and longitudinal in vivo noninvasive evaluation of macrophages infiltration and an assessment of therapy action. Magnetic resonance imaging (MRI) is considered to be the imaging modality of choice for the demonstration of infectious synovitis due to its high spatial resolution and soft tissue contrast. Signal changes observed on MRI in arthritis low T1 and high T2 signal reflecting the increased presence of extracellular water content, and a marked enhancement after gadolinium based-contrast agent administration, consistent with the histologically findings of increased vascularity owing to vasodilation and angiogenesis1. Nevertheless, MRI is often unable to demonstrate resolution of infection during antibiotic therapy as persistent enhancement can be observed in the joints of patients with clinically and biologically healed septic arthritis due to persistence of enlarged extracellular space (granulation tissue, fibrotic scar)2. 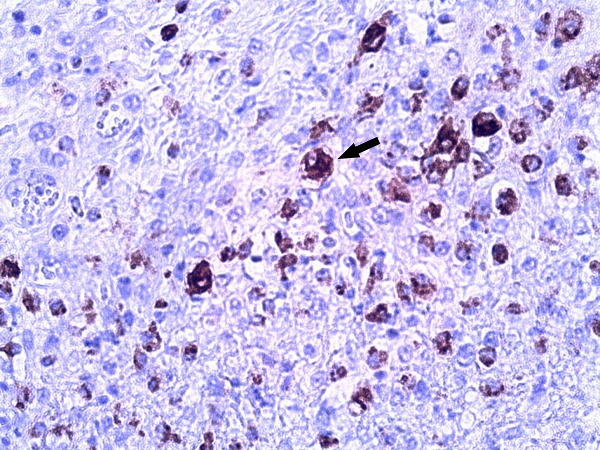 Besides extracellular changes, inflammatory cells including an intense recruitment of macrophages massively infiltrate the infected synovia. Macrophages play a major role in both the acute and chronic phase of bacterial infection 3. They induce the inflammatory reaction required to eradicate pathogenic microorganisms, and coordinate inflammation resolution, as macrophage-induced inflammation persists as long as necrotic tissues are not removed, preventing repair to begin4. Thus, the reduction of macrophage infiltration within infected synovia after efficient therapy can be a reliable indicator of the resolution of the infection. Cellular imaging is able to demonstrate specific cellular infiltration inside pathologic tissue. Specific macrophage MR imaging using targeted contrast agent has been widely investigated and has demonstrated its ability to demonstrate joint inflammation or infection5-7. After intravenous injection, such targeted contrast agents such as USPIO (ultrasmall superparamagnetic iron oxides) particles are taken up by phagocytic cells such as macrophages and, due to their magnetic properties, induce signal changes in tissues presenting macrophage infiltration8. The longitudinal follow up of those MR signal changes therapy allows for an in vivo noninvasive evaluation of macrophage infiltration, and a reduction of USPIO loaded-macrophages related signal changes would demonstrate therapy success. The purpose of this report is to present how to perform macrophage MR imaging to noninvasively monitor septic arthritis by demonstrating the reduction of macrophage infiltration within the synovia. All procedures involving animal subjects have been approved by the University Hospital Institutional Animal Care committee. Before injection, anesthetize rabbits by means of intramuscular injection of ketamine (30 mg/kg of body weight) mixed with xylazine (4 mg/kg) within Erector Spinae muscle. Ensure animals are fully anesthetized by checking that they fail to respond to paw pinch. This protocol provides sufficient anesthesia for the intraarticular injection of the knee joint. Place the animals under oxygen mask during anesthesia. Shave animals' knee. Prepare the knee for aseptic injection by 3 alternating wipes of povidone-iodine scrub and alcohol followed by application of povidone-iodine solution. Manually identify the patellar tendon as an elastic structure at the anterior aspect of the knee using a sterile needle cap as shown or a sterile probe. With visual control and by using an anterior approach, place a 25 G needle percutaneously in the right knee of each of the 12 rabbits through the patellar tendon. Inject each knee with 1 ml of a bacterial suspension of Staphylococcus aureus (Neumann strain) at a concentration of 106 UFC/ml. An injection without resistance confirms the intraarticular location of the tip of the needle. After injection procedures, keep the animal under convective source to avoid heat loss and monitor respiratory rate by observing movement of the chest. Once awake, keep animals in cages with free access to food and water. Manage pain by administering an intramuscular injection of 0.1 mg/kg buprenorphine every 8 hr. Clinically observe rabbits each day, monitoring consumed quantities of food and water, weight loss, temperature, and general behavior. To image the acute phase of infection perform the first MR imaging session as soon as an animal presents substantial weight loss (10%); generally this occurs after about 2 days. If intravenous drug administration is required before MRI examination, an auricular venous access could be installed (cf. below). When imaging live animals, a careful animal installation is a key feature to ensure animal comfort and optimal anesthesia. This will allow for best imaging results and ensure a reproductive image acquisition for longitudinal studies. Due to the size of the animal, the use of a clinical-sized MR unit (1.5 T or 3 T) is most suitable. 8-channel clinical knee coil is used as it provides suitable resolution and contrast-to-noise ratio for rabbit knee exploration. Before installation on the imaging system, install a peripheral venous access through an auricular vein. This access will serve to inject the contrast agent. Shave and disinfect the ear. Perform local anesthesia by subcutaneous injection of lidocaine. Insert a 25 G catheter inside the lateral auricular vein. Assess the permeability by injection of 1 ml sterile physiological serum. Maintain the catheter with adhesive tapping. Anesthetize animals by means of intramuscular injection of ketamine (30 mg/kg of body weight) mixed with xylazine (4 mg/kg). Animals are fully anesthetized once they fail to respond to paw pinch. Place a facial mask on the rabbit, giving it oxygen with a flow rate of 200 ml/min. Once fully anesthetized, take animals to the MR imaging unit. Place animals so that the knees are located in the center of the MR coil. Place the animals' legs in complete extension, so that the long axis of the tibia is parallel to the MR imaging unit table. Use Velcro fasteners or sand bags to maintain optimal leg position. Cardio-respiratory monitoring of the animals is not required as the anesthesia protocol allows deep anesthesia on spontaneous breathing, but animals have to be covered to avoid anesthesia-induced heat loss. MR protocol is detailed in Table 1. The average time for total acquisition including optimal installation is about 20 min. Perform MR imaging in different planes. Nevertheless, the transverse plane of the knees (orthogonal to the tibia) is the reference plan as it ensures anatomic reproducibility of image position for sequential longitudinal examinations and allows optimal correlation with histologic slices. At the completion of unenhanced sequences, inject the UPSIO contrast agent through the auricular venous access. Slowly administer the iron oxide particles in a single dose of 150 μmol Fe/kg. Rinse the catheter by injection of 1 ml of sterile physiological serum. Repeat the enhanced GRE weighted sequence 24 hr after the injection. This delay allows the particles to be phagocytized by the macrophages. For longitudinal studies evaluating drugs effect (antibiotics, steroids, anti-macrophage antibodies, etc. ), repeat sequential MR examinations using the above-described protocol. For longitudinal evaluation perform measurements at the same anatomic level, and define an easily identifiable landmark. For instance, acquisition through the axial plane where the greatest diameter of the patella is observed is a reliable way to obtain reproducible measurement (Figure 1). 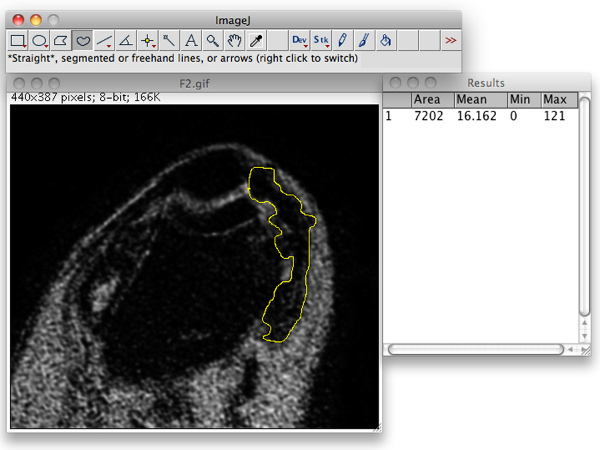 Perform image analysis using a DICOM-based software (such as Osirix) or an image processing software (ImageJ). Using ImageJ software, perform the segmentation of the synovial area that demonstrates signal loss on USPIO-enhanced GRE T2-weighted image using the "irregular area" drawing tool. Once the synovium with dark signal is outlined, click on "Analyze" to obtain the area/ number of pixels (Figure 2). On unenhanced images, the synovium of infected knees presents a diffuse swelling of intermediate signal that is non distinguishable from surrounding soft tissue, while femur and patella appear as low signal structures (Figure 1). On the USPIO-enhanced images, 24 hr after the contrast agent administration, synovial area containing USPIO-loaded macrophages will demonstrate signal loss (Figures 1 and 2). Macrophage infiltration within synovium can be demonstrated using specific immunostaining (Figure 3). Perls' Prussian blue stain can detect iron particles, which appear as blue dots (Figure 4). Table 1. Example of parameters of GRE T2-weighted MR sequence on a 3T MR unit. Figure 1. Axial GRE T2-weighted images of a rabbit knee at the acute phase of infection, before (A) and 24 hr after (B) intravascular administration of the USPIO; Images are obtained at the level of the patella (p) and femur (f). On the unenhanced image (A), the synovium is thickened (arrow) and presents a homogenous intermediate signal indistinct from the surrounding soft tissues. After USPIO administration (B), the synovium appears now as a band-like area of massively dark signal (arrowhead) due to the presence of USPIO-loaded macrophages. (reprinted from Lefévre S. et al.9 with permission). Figure 2. Segmentation and determination of the synovial area that presented signal loss using ImageJ. Figure 3. Photomicrograph of specific macrophage immunostaining demonstrates the intense infiltration of macrophages within the infected synovium (arrow). (RAM 11 immunostaining, original magnification 40X). Figure 4. 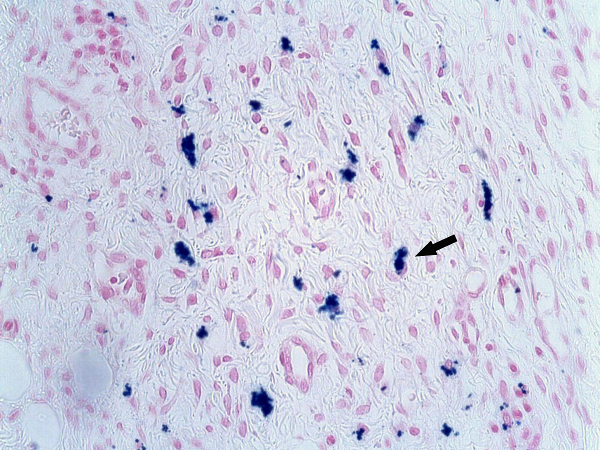 Photomicrograph (Perls' Prussian blue stain, original magnification 40X) shows multiple blue-stained cells correspondig to the USPIO-loaded macrophages (arrow). (Reprinted from Lefévre S. et al.9 with permission). While nonspecific gadolinium-based contrast agents provide information about the volume and perfusion of the extracellular space, macrophage imaging by USPIO-enhanced MR allows a precise anatomical localization and a qualitative evaluation of macrophage infiltration within infected synovium without the need of tissue sampling9. Due to their high sensitivity, USPIO can demonstrate even subtle cellular infiltrate present in the early phases of infection. Under successful antibiotic therapy, as the pathogens are progressively removed, this infiltration is considered to decrease, leading to the reduction of USPIO uptake within the synovium. As the area of dark signal is correlated to the tissular iron content, synovial signal after USPIO administration can be considered as a biomarker, a quantitative representation of cellular infiltration that can be longitudinal evaluated10. In addition, and in contrast to other imaging modalities such as optical imaging or isotopic imaging, cellular MR imaging has the ability to generate high-resolution anatomic images that permit precise localization of cells-related signal changes. Macrophage imaging allows the estimation of cell presence and distribution within tissue of interest without the need of tissue sampling. It therefore avoids two main drawbacks of repeated tissue sampling often-required in in vivo biological studies that are invasiveness and modification of native tissue normal biology. Moreover, sequential tissue sampling might be not possible in small animals that don't tolerate repeated stressful procedures, precluding longitudinal evaluation. In contrast, in vivo follow-up imaging of macrophage content within a tissue using sequential USPIO-enhanced MR scanning can be easily applied to small animals for the longitudinal monitoring of antibiotic therapy in infectious diseases, of anti-inflammatory therapy in models of noninfectious arthritis, or of treatment in any macrophages-involved diseases. Once the model of interest is chosen (arthritis, septic synovitis, etc. ), contrast agent administration is easily performed through slow intravascular injection and is in general not technically challenging. The main limitation of MR cellular imaging using USPIO contrast agent is the need for repeated scanning 24 hr injection, this delay allowing the specific phagocytosis by macrophages5-7. Therefore, in order to have comparable imaging data, a precise animal installation within the MR unit is mandatory. In our experience, we observed that animal installation in prone position within the MR coil associated with lower leg complete extension obtained by adhesive taping allowed highly reproducible and comparable images. We presented in this report how to easily label in vivo macrophages with USPIO, taking advantage of their natural phagocytic activity. Even if an additional preliminary ex vivo procedure might be required (to allow contrast agent penetration into not natural-phagocytic cells), cell labeling with highly sensitive MR contrast agent such as iron oxide particles can be applied to other cell types such as lymphocytes, polymorphonuclear leukocytes, or mast cells. Cellular MR imaging can therefore be a very interesting tool for the noninvasively investigation of the sequential recruitment of all cell types involved in infection-related inflammation, and to evaluate the impact of general as well as cell-targeted therapies. We sincerely thank F. Bierry for assistance in video production and editing. Madri, J. Inflammation and healing. Anderson's Pathology. Kissane, J. 67-110 (1990). Sephel, G., Woodward, S. Repair, regeneration, and fibrosis. Rubin's Pathology. Rubin, R., Strayer, D. 5th ed, Lippincott Williams & Wilkins. Philadelphia, PA. 71-98 (2008). Verdrengh, M., Tarkowski, A. Role of macrophages in Staphylococcus aureus-induced arthritis and sepsis. Arthritis Rheum. 43, (10), 2276-2282 (2000). Heale, J., Speert, D. Macrophages in bacterial infection. The Macrophage. Burke, B., Lewis, C. Oxford University Press. Oxford, England. 210-252 (2008). Bierry, G., et al. Macrophage activity in infected areas of an experimental vertebral osteomyelitis model: USPIO-enhanced MR imaging--feasibility study. Radiology. 248, (1), 114-123 (2008). Bierry, G., et al. MRI of macrophages in infectious knee synovitis. AJR Am. J. Roentgenol. 194, (6), W521-W526 (2010). Lutz, A. M., et al. Detection of synovial macrophages in an experimental rabbit model of antigen-induced arthritis: ultrasmall superparamagnetic iron oxide-enhanced MR imaging. Radiology. 233, (1), 149-1457 (2004). Weissleder, R., et al. Ultrasmall superparamagnetic iron oxide: an intravenous contrast agent for assessing lymph nodes with MR imaging. Radiology. 175, (2), 494-498 (1990). Lefevre, S., et al. Septic arthritis: monitoring with USPIO-enhanced macrophage MR imaging. Radiology. 258, (3), 722-728 (2011). Sigovan, M., et al. Rapid-clearance iron nanoparticles for inflammation imaging of atherosclerotic plaque: initial experience in animal model. Radiology. 252, (2), 401-409 (2009).